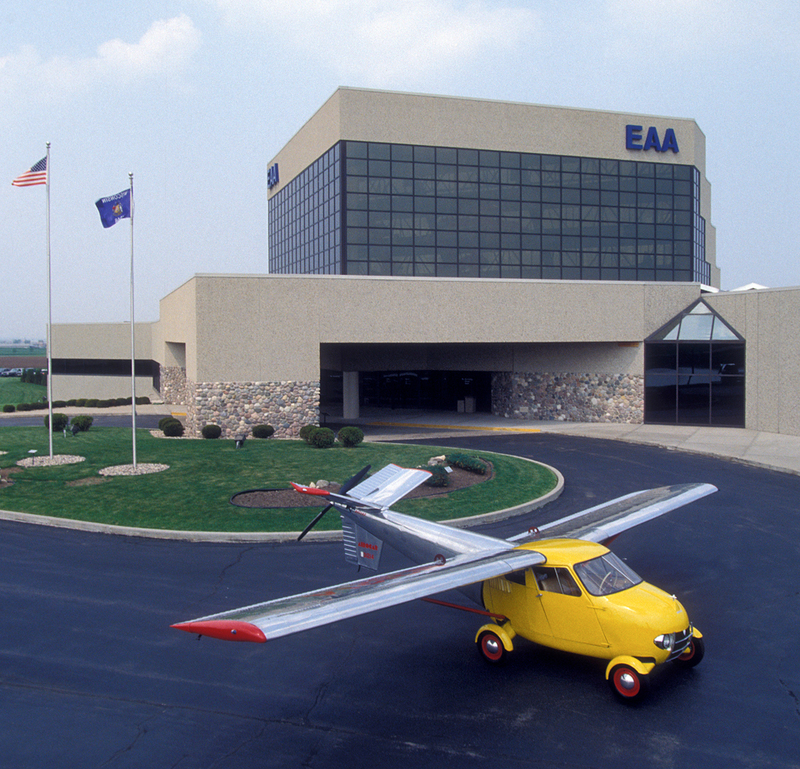 EAA’s rebuilt prototype of the classic Aerocar represents a revolutionary concept. 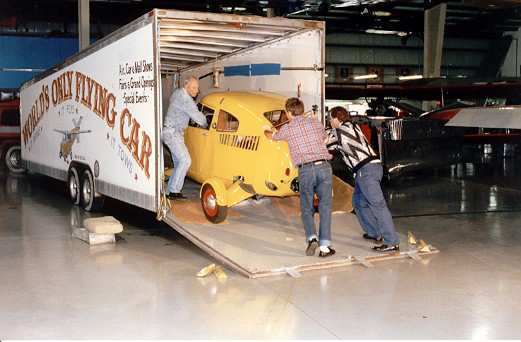 Not only can it be readily converted from an airplane to a roadable car, but also its wings can be folded back along the sides of the detached fuselage and towed behind the automobile like a trailer. Thus, it is not necessary to leave its wings, tail and propeller at an airport for it to be driven on the highway, and one does not have to return to the same airport in order to fly again. 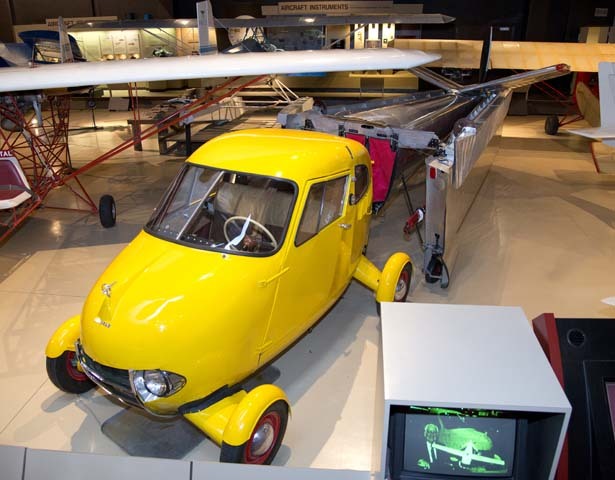 The idea for the Aerocar occurred to its designer, Moulton (Molt) Taylor, in 1946. 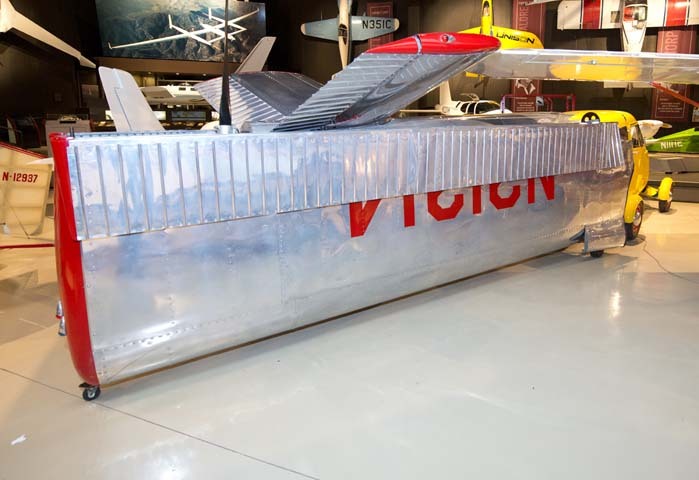 During a trip to Delaware he met inventor Robert E. Fulton Jr., and became captivated by the concept of his roadable airplane, the Airphibian. 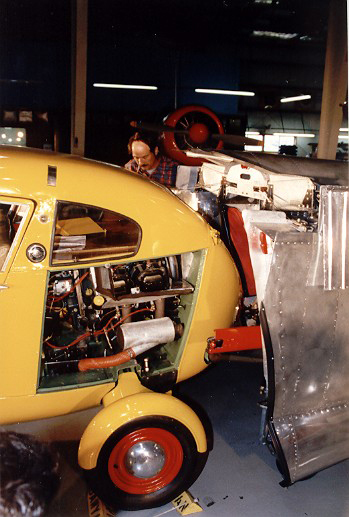 Molt immediately saw the weakness in the fixed, detachable wings of Fulton’s design, and set about building his prototype Aerocar with folding wings, which he completed in 1949. 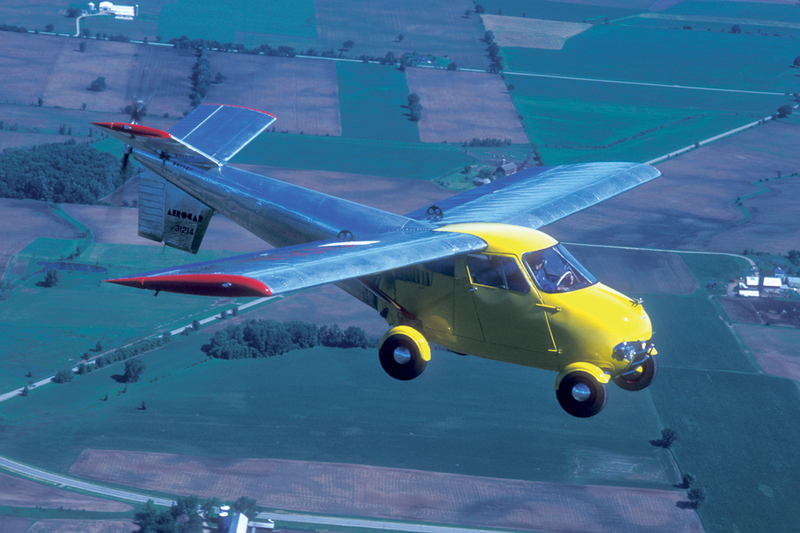 After a successful demonstration flight, Molt promoted the Aerocar at aircraft and auto shows and on TV. 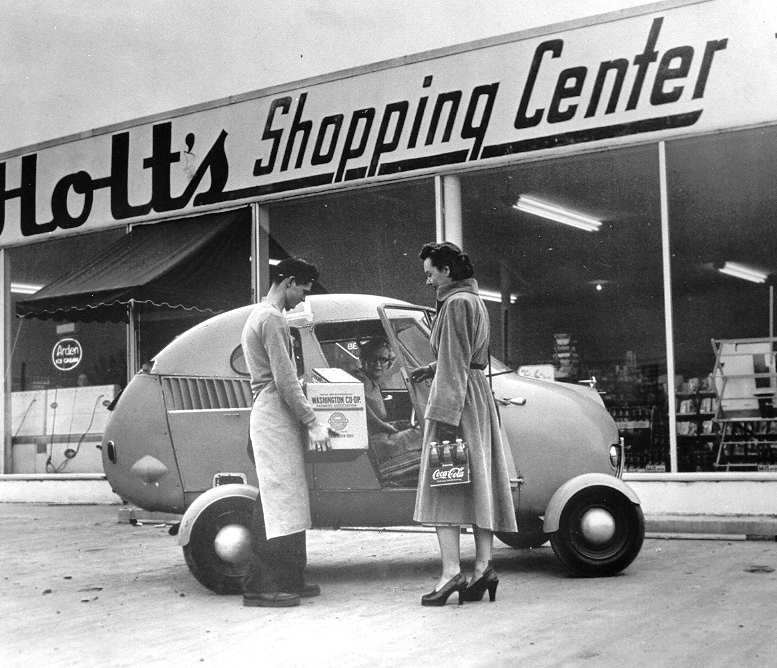 As the flood of inquiries poured in, Molt raised money to certify the machine as an airplane, and to build four “pre-production” Aerocars for demonstrations and eventual sale. 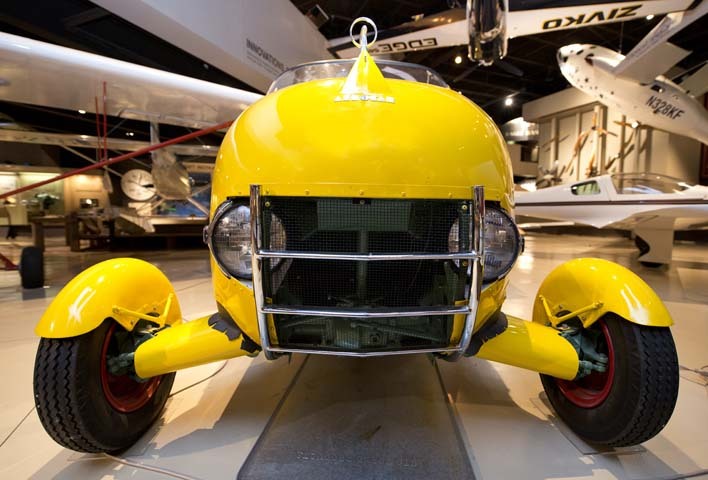 The Aerocar is a two-place aircraft with side-by-side seating, four wheels, high, unobtrusive wings, and a single Lycoming 0-320 engine mounted over the rear wheels. The propeller is mounted at the end of a long tail cone, and the latter is angled up considerably, to provide adequate propeller clearance. Its cruise speed was 100 mph, and it initially sold for $25,000. 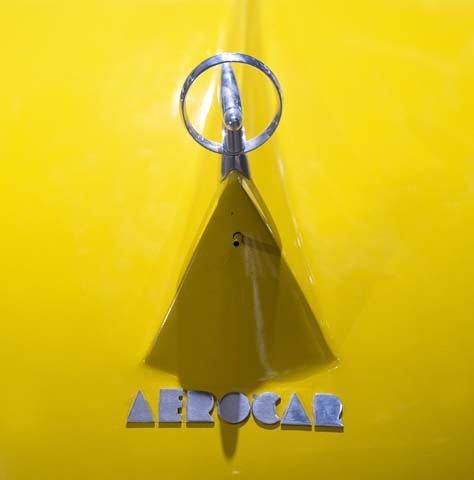 Aerocars represent the only certified airplane in history that could also drive on our highways. Three other examples of the Model I still exist: N101D is now owned by Greg Herrick; N102D, once owned by TV host Bob Cummings, has been restored by Ed Sweeney in Black Forest, CO; N103D is no longer airworthy, but is owned by Mildred Felling in Grand Junction, CO. Only one example of Model II was ever built. Now owned by Ed Sweeney, it featured tricycle landing gear and accommodated four people. 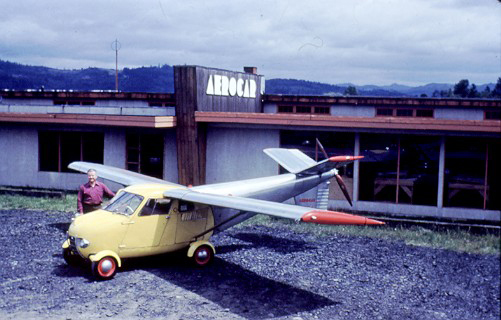 Perhaps the most interesting Aerocar is the Model III. Like the Model I it has two seats and four wheels, but the wheels partially retract, thereby allowing a slightly faster cruise speed. It was aerodynamically redesigned to look more like a Jaguar than a Crosley. EAA’s Aerocar has registration number N4994P, not the original N31214. This vehicle is truly unique because it is a restored version of Molt Taylor’s prototype. 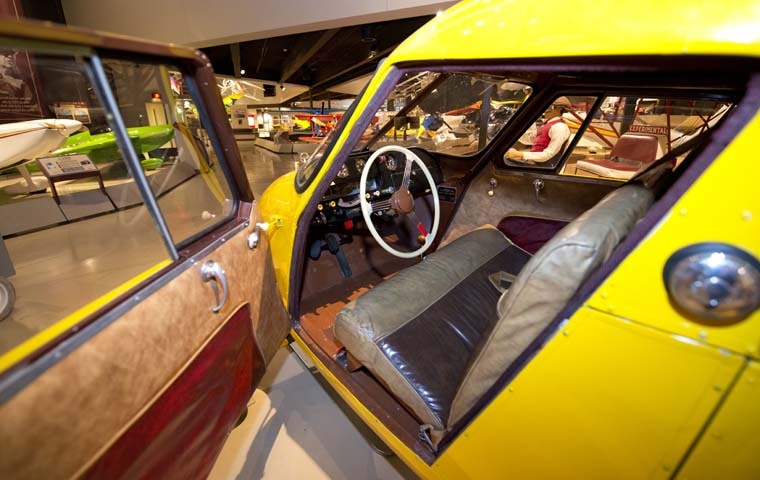 Its interior resembles that of a typical automobile of 1949, with a conventional steering wheel and gearshift stick from the floor. There is a toggle switch for the turn signal lights and a horn button on the steering wheel. However, the throttle is a large knob that protrudes from the middle of the dashboard. 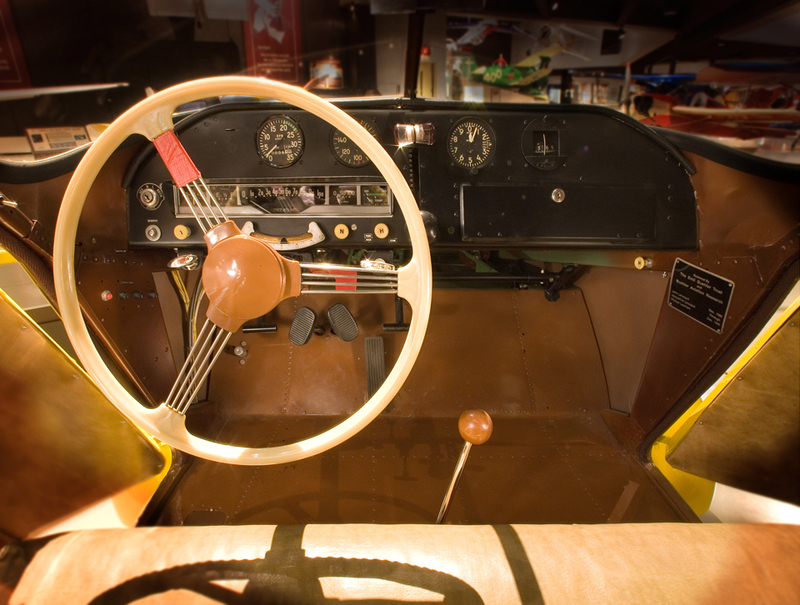 The auto instruments are on the left side, while the aircraft instruments are round gauges across the upper part of the dashboard.